The Norah Antique Inspired Sofa with Nail Head Trim by Coaster at Value City Furniture in the New Jersey, NJ, Staten Island, Hoboken area. Product availability may vary. Contact us for the most current availability on this product. 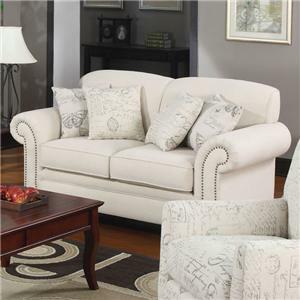 Fabric Options Soft oatmeal cream colored linen upholstery. Tailoring Clean and tailored look with welt cord trim. 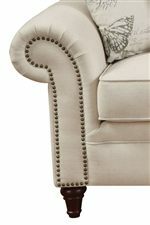 Arm Classic rolled arm with pleat fronts and individually place nailheads. Leg or Skirt Solid wood turned legs. Seat Support Pocket coil seating for extra comfort. The Norah collection will give your living room a French laundry style, offering the best of both antique and up-to-date designs. Light oatmeal linen upholstery is accented with shiny nail head trim. Rolled arms, tight scalloped back cushions, and turned exposed feet create a classic and timeless look. Accent fabrics with a butterfly print and French script print complete the antique inspired look. The Norah collection is a great option if you are looking for Transitional furniture in the New Jersey, NJ, Staten Island, Hoboken area. 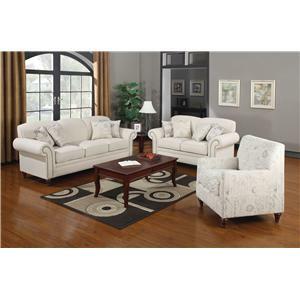 Browse other items in the Norah collection from Value City Furniture in the New Jersey, NJ, Staten Island, Hoboken area.